I found the unexpected when I started to read Edgar Allen Poe’s Tales. I was disappointed. 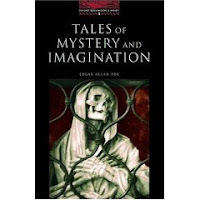 They had built up I my mind as scary, creepy tales, partly as a result of my mother saying not to read her copy of Tales when I was a child. Of course I got it out of the bookcase when she wasn’t around and had a peek inside and was scared and put it back quickly before she caught me. I hadn’t looked at the book since. The first one I read, William Wilson, just wasn’t scary at all. I didn’t find it mysterious, or very imaginative either. I read this a few days ago and on reflection it wasn’t as bad as I first thought. It’s about the nature of personality and how we can’t see or come to terms with our own nature. If you don’t want to know the story then you’d better not read any further, but I did find it predictable and so there was no suspense or shivery feelings for me in this tale. So I thought I’d try one I’d heard of and read The Fall of the House of Usher, having a vague memory of seeing an old black and white movie with Boris Karloff opening a huge, ancient door, covered in cobwebs and creaking loudly on its hinges, at the dead of night. I’ll write about what I made of this in another post. I think that a lot of Poe’s wok has been imitated in the years since he was writing. And of course his style is quite old-fashioned 🙂 But I’m still a fan of his. The Tell-Tale Heart is one I’ve always enjoyed, and think it is creepy. Thanks, Fence, in anticipation of a creepy read I’ll read The Tell-Tale Heart next. I have never read any Poe – and I’m sure I should have – but as I was reading your review of William Wilson I immediately knew who the other William Wilson was (as you did) and, of course, because my short story that was a novel travels roughly similar territory (thank you so much for your comment about it), I think I should add his work to my reading list. But the thing is, I hate being haunted (in a bad way) by a story. And I also hate being disappointed … but then she who doesn’t venture … . I’m reading Edgar Allan Poe for this challenge as well. I’m reading the short version, though (only 12 stories). I finished my first three on Sunday and they were very creepy…especially The Black Cat which I hadn’t read before.